£27pm thereafter. Set-up fees apply. Sky Entertainment £22pm, 18-month minimum term, £27pm thereafter. Set-up fees apply. Sky Entertainment £22pm with a new 18 month minimum term. Standard price applies when not signing up to a new minimum term or outside of minimum term: £27pm. All Sky Q kit is loaned to you at no cost and must be returned at end of your subscription. Game of Thrones® ©2019 Home Box Office, Inc. All rights reserved. Follow more highs and lows from America's first communities in the 17th century as the period drama returns. Groundbreaking wildlife series exploring the extreme regions, from the Arctic to deserts, and the extraordinary ways in which animals have adapted to survive them. Kate Winslet, Rosamund Pike and Taron Egerton are among the all-star cast of this Sky Original production, bringing Tove Jansson's adored classic books to life. British choreographer and dancer Akram Khan explores what makes us dance in this four-part series. The Emmy award-winning actor Bill Hader returns as the hitman who finds a surprising outlet in an acting class. With Angela Bassett and Jennifer Love Hewitt. Prepare yourself for Game of Thrones' epic final season - watch the fight for survival as the tale of lust, treachery and bloodshed draws to a close. The best of Netflix & Sky, all in one place. With Sky Entertainment £22pm, 18-month minimum term, £27pm thereafter. Set-up fees apply. Saving based on monthly cost of Netflix standard plan (£7.99) & Sky Box Sets (£5). Add Sky Broadband Unlimited to Sky Entertainment. £18 a month for 18 months + £39.95 one-off cost. With Sky Entertainment at £22 a month for 18 months. Sky network areas only. New Sky Broadband, Talk and line rental customers only. Separate contracts for Broadband & Talk. Further terms apply. Add Sky Fibre Max to Sky Entertainment. £27 a month for 18 months + £39.95 one-off cost. With Sky Entertainment at £22 pm for 18 months. Sky Fibre areas only. Subject to status. Available to new Sky Broadband & Talk customers taking Sky Fibre Unlimited, Sky Talk & line rental. Further terms apply. Enjoy a new premiere every day and over 1,000 movies on demand - all in stunning HD. With Sky Entertainment £22pm, 18-month minimum term, £27pm thereafter. Set-up fees apply. Cinema saving compared to current £19pm non-contract price. Only pay for what you love - choose from 7 dedicated channels including Premier League, Football, F1®, Cricket and Golf. With Sky Entertainment £22pm, 18-month minimum term, £27pm thereafter. Set-up fees apply. Complete Sports Pack £30pm outside of 18-month min term. They'll be in good company and well entertained with favourite characters from shows they love. With Sky Entertainment £22pm, 18-month minimum term, £27pm thereafter. Set-up fees apply. Bring the shows you love to life. See nature in all its glory, or high definition dramas that make even the bad guys look good. With Sky Entertainment £22pm, 18-month minimum term, £27pm thereafter. Set-up fees apply. HD TV required. Watch everything from your main box on TVs and tablets around your home with Sky Q Mini boxes. With Sky Entertainment £22pm, 18-month minimum term, £27pm thereafter. Set-up fees apply. All Sky Q kit loaned to you by Sky. Browse our range of the latest devices, including iPhone XS and iPad. New 18 month contracts. Separate contracts apply for TV: £22pm, Broadband Unlimited (including line rental): £20pm and Sky Talk Pay As You Go: £0pm. Sky network areas only. 1. Can I get Sky Sports without taking Sky Entertainment? ● Any Sky TV package must include our Sky Entertainment pack - it comes with over 300 channels like Sky Atlantic, Discovery and Nat Geo as well as 60 Catch Up channels, all on the incredible Sky Q box. 2. Can I add BT Sports? ● Once your Sky TV services are active, you can contact BT to add BT Sports to your Sky account. 3. Can I have Sky TV installed in my home without any drilling? ● As the dish needs to be fixed to your house, there may be a small amount of drilling needed to get your Sky TV services working. Our engineers can advise on options according to your needs on the day of installation. 4. Can I watch a boxing match on Sky Box Office without a subscription? ● You'll need a Sky TV subscription to watch any of our Sky Box Office events. 5. What is Sky Q experience? ● Download the Sky Q app to enjoy live and on demand TV on your compatible tablet or mobile. With Sky Q experience, you can save your Sky Q recordings to your mobile device and watch them when you want. 6. I already have a Sky box, will I still need an engineer visit? ● To ensure the best possible viewing experience, our engineers provide you with new equipment and complete the set up for you. 7. How do I know if I can get Sky TV at my address? ● We estimate over 90% of UK homes can get Sky TV. If we find your property is ineligible to receive our Sky TV services, you should still be able to get great Sky content through Now TV. 8. What content is available in Ultra HD? 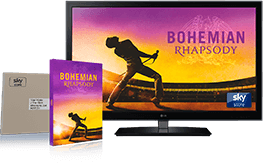 ● With Sky Entertainment, Sky Q experience and a Sky Q 2TB box: Documentaries from Nat Geo and Discovery, including David Attenborough epics, live music events, plus Catch Up drama & comedy shows. ● Add Ultimate On Demand for: a selection of UHD Sky Box Sets and all Netflix Ultra HD shows. ● Add Cinema for: 200 movies in UHD, plus new movies every week. ● Add Sky Sports for: live sporting events - including Premier League, F1®, darts, rugby and boxing in UHD. Don't forget, you'll need a UHD TV to watch all this great Ultra High Definition content. 9. Can I get rewards with Sky TV? ● Once you become a customer, you can benefit from our VIP and loyalty programme and we offer rewards when you introduce your friends to Sky TV. 10. Can I get Sky Go without a subscription? ● Sky Go is an exclusive benefit of your Sky TV subscription. You'll even be able to watch before your installation date - simply create a Sky iD and download Sky Go to your compatible device. You'll be prompted to do this once you've confirmed your order. Comparison based on Sky Q 2TB box and Virgin V6 box. * Sky Q Wi-Fi hotspots: can improve speed and coverage in hard to reach areas of your home compared with using a Sky Q router alone. Your wireless speeds cannot exceed the fixed line speed coming into your home. The longer you're with us the better it gets. Join Sky VIP for free and choose from a range of exclusive rewards – from money-can't-buy experiences to free tickets to events across the country. We always strive to innovate, in order to give you the best experience possible. It's probably why USwitch recently presented us with the Award for Best Smart TV Box and Best TV Content for 2017. Many of our Box Set shows have also picked up awards from around the world. Our professional engineers install everything and show you how to make the most of Sky. Once you confirm your order and select a set-up date, your viewing card will be sent to you in the post. You can check the status of your order at any time, using our tracker service. A Sky engineer will call the day before, or on the morning of installation, to confirm their arrival time. On the day, your engineer will set it all up and show you how to make the most of your Sky TV. Any friend of yours is a friend of ours. Invite them to join Sky TV with exclusive offers and get rewarded for every friend who does. We've partnered with Devialet, one of the most innovative names in audio, to deliver a sound so real you'll think you're at the heart of the action. Choose to own on digital, or add the DVD or Blu-Ray if you like. Plus get £5/€5 off when you try Buy & Keep if you’re new to Sky TV. Sky Protect covers your Sky equipment, TVs, mobiles, laptops and tablets for repairs or replacements - because you never want to be without your Sky TV. Sky Hub: Inclusive for new Sky Broadband customers. Range may be affected by home environment. Speeds vary significantly with location.